Before introducing new crops to your greenhouse your first task should be to review the specific cultural requirements such as light, temperature, water, fertility and other needs. This will help you to group plants according to their requirements in your greenhouses. For example, Angelonia will not grow well in a cool house with your petunias, and Osteospermum will stretch if grown in a house that is too warm. The next step is to prevent pest infestations on crops you haven't grown before by setting up sticky cards for early detection. We have learned that some crops are more susceptible than others to insect pests such as whiteflies, aphids and thrips. Until you become familiar with a crop, make an extra effort in your scouting routine to monitor unfamiliar crops. Finally, find out about the growth habit of the plant before using it in mixed planters. As many growers found out this past spring, some plants, such as those in the mint family will take over a planter and should be used sparingly. Some plants do poorly during the hot summer months while others will thrive. Become familiar with the individual plants you are using in mixed containers. Use plants that compliment each other, not only in appearance for sale but in longevity. Use your imagination, be creative and have fun with all the new plant material that is available. Osteospermum (Cape Daisy, Osteo, South African Daisy, Sunscape Daisy, Blue-eyed Daisy) represents a group of about 70 species of annuals, perennials and shrubs originating from South Africa. They have daisy-like flowers that come in a wide range of colors in shades of rose, purple, white, pink, peach, bi-color and yellow. Most have blue disc flowers until yellow pollen is shed. Yellow cultivars tend to have yellow or off-white centers. Depending on the variety, in the garden, plants height ranges from 6" - 2.5 feet high with attractive dark foliage. Osteospermum flower most profusely from early spring to mid summer. Flowering slows down during the heat of summer for most varieties and returns in the fall in response to cool night temperatures. Some of the new introductions such as the 'Soprano' Series are advertised to bloom continually throughout the summer. Osteos will withstand frosts, but not hard freezes. Flowers close up during cloudy weather and at night. They can be grown as perennials in very mild climates. In Massachusetts, they are grown as annuals for use in containers, hanging baskets or in the garden. Osteospermum makes a nice addition to the very early-season bedding plant market, along with perennials, pansies, cyclamen and other cool crops. There are many different cultivars to choose from with many recent introductions. Culture. High light intensity, cool temperatures and early pinching are basic requirements. Osteospermum is a +/-12 week crop from rooted cuttings. Allow 4 weeks longer for unrooted cuttings compared with rooted cuttings. Plant 3-4 liners per 8-10" pot and 1 liner per 4-6" pot. Start Osteos with vegetative cuttings January to March for spring finish. Plants are typically propagated from cuttings dipped in a low concentration of rooting powder and placed under mist or in a humidity tent. Bottom heat enhances root development. Temperature of the rooting medium should be 70-75°F during the first 2 weeks of propagation. Once roots initiate, reduce to 60°F. Avoid excessive misting during propation that results in cooler media temperature, slow rooting and stretch. Osteospermum is susceptible to root rot diseases during propagation and cuttings may benefit from a broad-spectrum fungicide drench. Transplant rooted cuttings in a soilless growing medium four to five weeks after sticking cuttings. Grow plants for about four weeks at warm temperatures (68-70º F night) to establish root systems. Of this four weeks, allow 1-2 weeks after transplanting for rooted cuttings to get established before pinching out the growing tip, leaving 4-5 nodes for 4" pots and hanging baskets and 6-7 nodes for 6" or larger pots. Height of the stem would ideally be no more than 1.5" after pinching. After pinching, allow another 1-2 weeks of vegetative growth. Osteospermum responds well to DIF. If possible, provide negative DIF (65-75º day/night) to promote additional branching. Once cuttings are established, and side shoots are visible, move the pots to cold area or lower the night temperature to 45-55°F for four weeks. Osteos flower in response to night temperatures below 55°F. This period of four weeks will result in the greatest bud set and flowering. If plants are subjected to frequent high temperatures, plants may develop fewer flowers. The highest quality plants are finished at cool temperatures (50-55°F) and high light. To shorten the flowering time, plants may be finished at 60-65°F. Warm day temperatures will promote faster growth and the need for height control. Grow Osteospermum at a pH of 6.0-6.2 and a constant feed using 200 ppm nitrogen as a starting point and adjust levels as needed. Excessive feeding and/or using ammonium-based fertilizers can cause excessive elongation. The biggest challenge in production is height control. Cool temperatures and high light are th best control methods for preventing stretch. DIF and/or growth retardants can also be used to control height. Spray applications of B-Nine at 2500 ppm have worked well during the first 3-4 weeks after pinch according to Ecke's production guidelines. Higher rates may delay flowering and later applications can cause changes in the flower presentaion such as flattening the ray petals of the spoon varieties. Cycocel applied as a drench has also been successfully used when completed before visible bud. Spray applications of Cycocel have been used starting after pinch through visible bud stage. Sumagic and Bonzi have also been reported as effective on Osteospermums. Growers should apply growth regulators on a trial basis. Osteos may also be pinched and trimmed multiple times to increase fullness. Pinching is not required on all varieties such as "Symphony" series. Osteospermum is susceptible to powdery mildew, phytophthora and verticillium and to fungus gnats, thrips and mites. Routine scouting will prevent problems associated with insects and diseases. Angelonia angustifolia is native to Mexico and the West Indies where it is cultivated as a perennial. There are about 30 species, but most cultivars are either A. angustifolia and A. integerrima. The flower stems are made up of about a dozen 1-inch snapdragon-like flowers. Angelonia is heat- and drought-tolerant, making it attractive in mixed planters and garden beds during the summer. Plants reach 18 - 24 inches tall, depending on the cultivar and temperature, growing taller in hot conditions. Many growers had problems with virus in some varieties a few years ago. Since then, Ball Seed Company has introduced 'AngelMist' series (A. angustifolia) which is available by vegetative cuttings in six colors and is advertised as being virus free from culture and virus-indexed stock. Culture. Angelonia can be grown for sale in 4-in. pots up to gallon containers or mixed planters. Plants can be propagated vegetatively from tip cuttings or by seed. Tip cuttings should have a rooting hormone applied and be placed in a well-drained rooting medium with 72-75º F bottom heat. Rooting in a 72-plug flat occurs in 7-10 days. Note that patented cultivars may not be propagated without a propagation license from the patent holder. Once transplanted, grow at temperatures 68-72º F days and 62-65º F nights. Provide as much sunlight as possible. Supplemental lighting will enhance branching. Plant growth will be delayed at temperatures below 60º F, but cool temperatures may be useful to slow down a crop if necessary. Use a well-drained soilless media with a pH of 5.5 to 6.2. Fertilize with 100 to 150 PPM Nitrogen, constant feed. If new growth is chlorotic, add chelated iron to the feed. Reduce fertilizer concentrations by one-half as visible buds appear. Pinch plants 10 to 14 days after transplanting once new growth is apparent, leaving 3-5 nodes. A second pinch to 3 nodes may be applied to plants in containers larger than 4 inches. Control height by maintaining moderate fertility and moisture levels and providing as much sunlight as possible. If needed, make 1 to 3 applications of a growth regulator tank mix (1500 PPM Cycocel and 3000 PPM B-Nine) starting 10 to 14 days after the first pinch. Florel reportedly causes leaf tip burn on Angelonia. Growth habits vary from cultivar to cultivar. Use Angelonia in plantings with silver-leaved plants such as dusty miller or silver plectranthus. The blue varieties also look wonderful with yellow marigolds. Advise your retail customers to plant Angelonia in full sun, in well-drained soils. Space plants 12 to 16 inches apart in garden beds and landscapes. They are also great as a cut flower. Shearing plants back approximately 50% midway through the season, will make the plants bushier. Plants will reflower heavily in 2 to 3 weeks. Calibrachoa is closely related to the petunia and was first introduced to Europe in the early 19th century about the same time as the petunia. In 1988 wild samples were collected from South America and, after breeding, the first 'Million Bells' was released in 1992. Currently calibrachoa is available in a wide range of colors, from purple-blue, soft lavender-pink, hot pink, cherry pink, white, apricot and yellow under the names of 'Million Bells', 'Liricashower', 'Celebration' and 'Colorburst' Series. Calibrachoa thrives in full sun and is fast-growing with hundreds of small, petunia-like flowers from spring through late fall. The plants are self-cleaning and have a low-growing, compact growth habit. Calibrachoa is perfect in baskets, window boxes or as a ground cover. Culture. Calibrachoa is vegetatively propagated by cuttings. Plant rooted cuttings from February to March for a spring finish, placing three liners per 8- or 10-inch pot, or one liner per 4- or 6-inch pot. Liners will finish in 9 to11 weeks in 8- or 10-inch pots and 6 to 7 weeks in 4- or 6-inch pots. Calibrachoa requires very high light and grows best in full sun during production. Provide finishing temperatures of (65-70°F). Make one soft pinch at liner planting. Florel can be effective in creating better branching for upright pots and hanging baskets with longer crop time. Growing media should be kept moist to avoid wilting. Maintain a pH of 5.5-6.0. Watch for iron deficiencies (new growth turning yellow) associated with high pH. Constant feed with a complete fertilizer at 200 PPM nitrogen. Extra iron may be required to promote good leaf color. Use of slow-release fertilizer in supplementing a constant liquid feed program may benefit your customer. Provide periodic clear water applications if excess soluble salts accumulate. Calibrachoa is susceptible to aphids and pythium root rot. Drench a fungicide labeled for pythium, especially on upright varieties just after transplanting. Ornamental sweet potato vine is grown for its decorative foliage and vigorous growth habit. It works nicely in mixed containers and as a ground cover. There are many varieties including: 'Blackie' and 'Black Heart' with burgundy-black foliage; 'Margarita' with lemon lime or chartreuse foliage and a graceful cascading habit; 'Tricolor' or 'Pink Frost' is variegated with violet-pink and blush; and the 'Sweet Caroline' series that come in a variety of colors and have smaller root systems. Culture. Plants are easily propagated from terminal cuttings or large tuberous roots that form after a season's growth. Cuttings from stock plants taken during fall and winter root easily (usually 4-5 days) under mist using a rooting hormone. Pinch plants one time, two weeks after planting rooted cuttings. If planting them in a mixed container, give them a second pinch about 2 weeks prior to sale and shape them so they don't take over the planter. Ornamental sweet potato is vigorous and it requires high light and relatively warm temperatures. Provide night temperatures of 55-60º F and daytime temperatures in the 70's. Each spring growers report seeing tiny raised bumps along the midrib and lateral veins of their plants. This condition was diagnosed as Intumescences and is not caused by disease. It develops under conditions of reduced transpiration such as low light or high humidity. We see the same type of damage on ivy geraniums each spring. Plants that have this condition eventually grew out of it when the weather warms up. More information on oedema and intumescense. The large tuberous roots (sweet potatoes) have been another consideration when growing ornamental sweet potato. Growers reported that the large roots protruded out of the top of the pots and in some cases actually burst pots apart toward the end of the growing season. The roots are edible, although for the purpose here, grown for ornamental use. New varieties such as the 'Sweet Carolina' series are available that have smaller root systems and are less vigorous making them more suitable for smaller containers. Armitage, A.M. 1997. Specialty annuals series: Angelonia. Greenhouse Grower. October issue. pp. 79-80. Armitage, A.M. 1996. Tips of the trade. Greenhouse Grower. February issue. Pp. 15-18. Beytes, C. 1998. Vegetative breeders join the pack party. GrowerTalks. August issue. Pp. 70-78. Erwin, J.E. 1995. 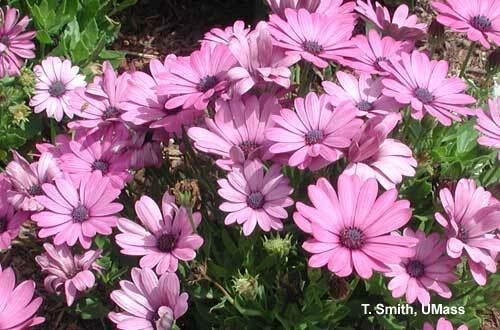 Try Osteospermum as a cool greenhouse crop. Greenhouse Management and Production. April issue. Pp. 62-63. Poehlman, K. 1997. 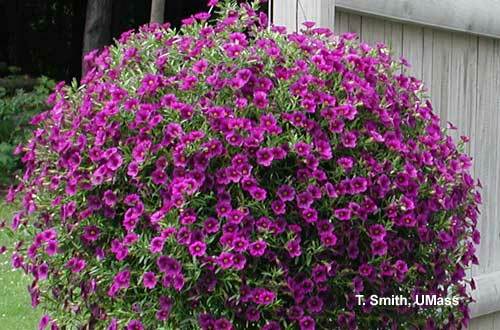 Proven Winners' Calibrachoa: Chimes like petunias. Greenhouse Grower. December issue. Pp. 11-14. Suzuki, A. 1997. Production schedule for Osteospermum ecklonis. Fact Sheet. The Ohio State University. Williams, J. 1997. Success with Osteospermum. Greenhouse Grower. April issue. Pp. 58-60. Osteospermum.com The site provides excellent photographs, FAQs, and articles on the botany, propagation, pests and diseases, and plant care of Osteospermums. Floridata.com has a brief descriptive article with two good pictures. The Ball Horticultural Company also has information. Click on cultural information on the left. Proven Winners Fact Sheet: Propagation and production information.